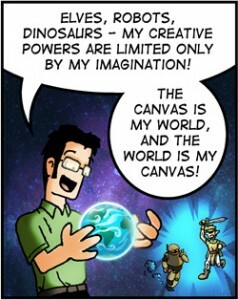 Did you know Wes Molebash is launching a new webcomic? It’s called Insert Image, and it launches August 6. It stars JP and Miles, the creative team at Paper City Church (pictured above), who spend their workdays drinking coffee and commenting on pop culture and church culture. 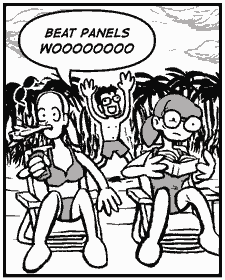 I know from his past strips You’ll Have That and Max vs. Max that Wes is a master of relatable and down-to-earth geek humor. Just from the teaser poster and introductory information on the site, it looks like it’s gonna be a lot of fun. So I’m excited about that. I’m also excited to be back from vacation with more comics to share with you. I’ll have a new SC strip up on Friday, and then tune in next week for Big O Parody Week. That’s right: I’ll be hitting you with new hand-drawn comics every day next week, spoofing everyone’s favorite film noir mecha anime from 1999. 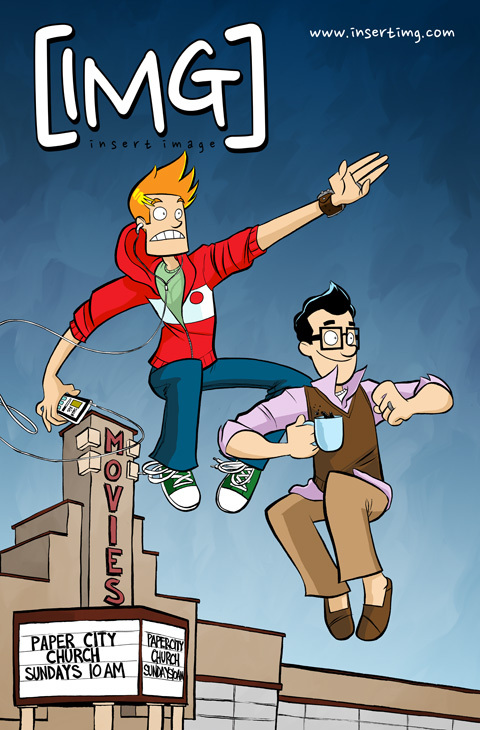 It’s a good time to be liking webcomics. 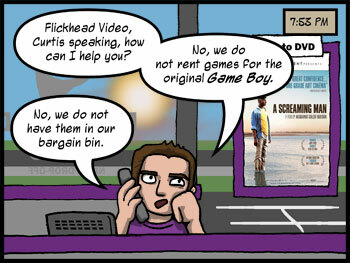 I have a guest strip up at Multiplex today! To all the visitors coming over from Multiplex: welcome! Sketch Comedy is a metahumor-and-pop-culture-commentary strip that updates on Tuesdays, Fridays, and sometimes other days too. Gordon McAlpin himself has appeared as a character in it: not once, not twice, but three times! As movie enthusiasts, you may also be interested in Sketch Comedy’s movie reviews, or this Christmas Star Wars spoof strip. I’ll have a brand-new strip for you tomorrow, so be sure to stop back. Have a look around and enjoy the comic. We’re glad you’re here. Here’s the game plan for the upcoming week. New comics will post on Monday (12/6) and Thursday (12/9), instead of the Tues/Fri that is my habit. Then, on Friday evening/Saturday morning, you can expect a review of The Voyage of the Dawn Treader, which I am super-pumped to see. (This will obviously be a very objective and unbiased review.) Also, keep your eyes on This Week in Webcomics, where I will post part one of my Webcomics Holiday Shopping Guide sometime this week! Woohoo, content! Enjoy the content, you guys. EDIT, 12/11 (evening): Okay, this Dawn Treader stuff is taking me a bit longer than I thought. I’ll have the review up sometime this upcoming week–hopefully Monday or Wednesday. But whenever the review goes up, I always shoot to get you new comics on Tuesday and Friday, so that’s priority number one here.